Jim Jarmusch has a penchant for discombobulation. His characters, while often appearing to be in charge, are really just being buffeted about by forces beyond their control. Luisa (Nicoletta Braschi) in Mystery Train articulates this confused state when she stumbles into the foyer of the Arcade Hotel in Memphis after being pursued by an Elvis freak and colliding with the chatterbox Dee Dee (Elizabeth Bracco). It’s been a hard day. Her husband has died and she needs a place to crash before flying back to Rome with the coffin. Things get even weirder later that night when Tom Waites plays Elvis’s haunting rendition of ‘Blue Moon’ during his graveyard shift on the local radio station and The King materialises before Luisa’s very eyes. In the next room, a young Japanese couple are making love. They’re on a pilgrimage to Sun Studios where Elvis recorded his first ever song, and to his legendary home at Graceland. Then there are the guys in room 22; The Clash’s Joe Strummer is an Elvis look-alike called Johnny and Steve Buscemi is his brother-in-law (or outlaw, as the case may be). They’re up to their eyeballs in trouble and sinking deeper by the second. 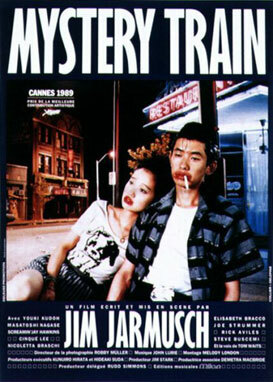 Mystery Train is the third in Jarmusch’s trilogy about outsiders wandering America’s derelict zones. It’s also the director’s first colour film and he revels in his new palette. There’s a particularly outrageous bright red suit worn by Screamin’ Jay Hawkins who provided the soundtrack for Jarmusch’s previous film Down By Law and who features here as the unflappable night clerk alongside Spike Lee’s little brother Cinque as the bellboy. But why have all these characters converged on this shabby hotel on this particular night? Maybe they’re all discombobulated or perhaps just lost in space? That, in the end, is the mystery.